Excerpted from Brian Bartels’ The Bloody Mary: The Lore And Legend Of A Cocktail Classic, With Recipes For Brunch And Beyond, out March 28. Read our interview with Bartels here. By the mid-1970s, the Bloody Caesar became Canada’s most popular cocktail. Originally, making clam juice had been a sore spot for bartenders. Speaking as someone who would rather engage the guests than break my elbows mashing clams and tomatoes for hours, I salute the good people of Clamato with my healthy elbows, which are better used for high-fiving friends, strangers, and playful dogs. And so should every other bartender alive! Combine all of the ingredients except the garnish in a cocktail shaker filled with ice. Roll the ingredients back and forth with another shaker three times and strain into a rocks or highball glass filled with ice. 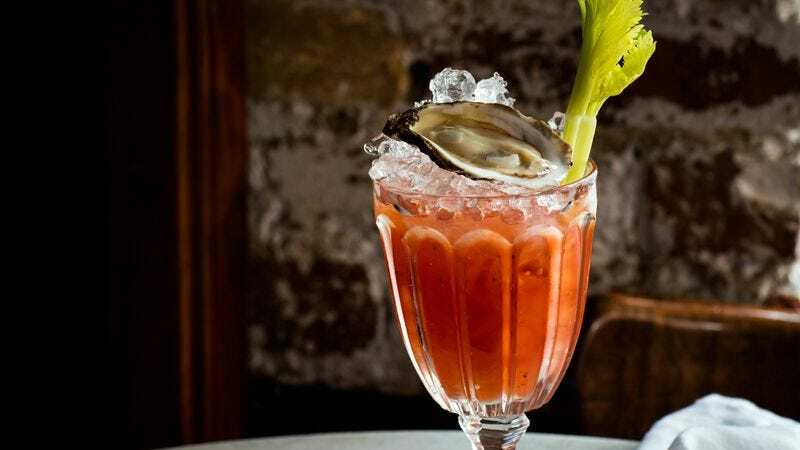 Garnish with a celery stalk and serve with the oyster on the half shell atop the glass.